First featured at Samsung's Premiere event last month, the ATIV Book 9 Lite is a lower cost alternative to the South Korean company's upcoming ATIV Book 9 Plus ultrabook. The new device features a 13.3-inch 1366 x 768 10 point capacitive LED touchscreen, an AMD A6 1.4 GHz quad-core processor, integrated AMD Radeon Graphics, Windows 8, 4 GB RAM, 128 GB internal memory, a mini VGA port, a micro HDMI port, a USB 3.0 port, a USB 2.0 port, 802.11 b/g/n wifi, Bluetooth 4.0, a gigabit ethernet port, and a 3-in-1 multi card slot. 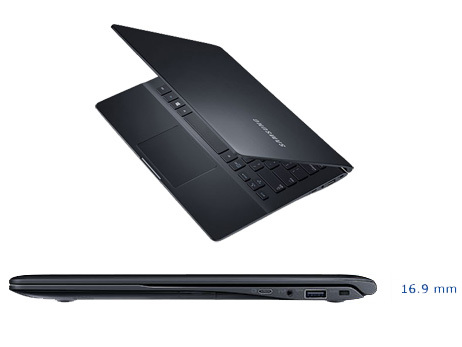 The laptop meets most of the recently updated requirements for the ultrabook category other than the processor and battery life. For this lower cost product, Samsung opted for a cheaper AMD chip instead of the ultrabook standard Intel Core. The processor in turn is less power efficient than a new Haswell chip and results in mediocre battery life (5.5 hours). All in all these are very functional specs and excellent connectivity options in a light (3.48 pounds) and compact design (12.76" x 8.82" x 0.69"). The ATIV Book 9 Lite is available for pre-order now in white or black, and will be in stores on July 27th. Prices start at US$799, though Samsung's own online store has it listed at US$829.99. RIDGEFIELD PARK, N.J. – July 15, 2013 – Samsung Electronics America, Inc. today announced the U.S. launch of the ATIV Book 9 Lite. Taking a page from the celebrated and iconic design of the Book 9 family of PCs, Samsung continues to deliver on the promise of ATIV by offering consumers cutting-edge technology, seamless convergence and unparalleled style in a slim, compact form factor. The sophisticated, yet affordable Book 9 Lite gives users everything they need to stay connected, productive and entertained. It is now available for pre-sale in the U.S. and will be in stores beginning on July 28. The ATIV Book 9 Lite offers the same premium and striking design identity as the ATIV Book 9 in a more widely accessible model. With a refined aerodynamic architecture, accentuated by a sophisticated Ash Black or Marble White color, users do not have to compromise style for performance. The ATIV Book 9 Lite is now available for pre-sale for an MSRP of $799.99 and will be available for in-store purchase beginning July 28. 12.76" x 8.82" x 0.69"
Samsung, ATIV, SideSync and ChatON are all trademarks of Samsung Electronics Co., Ltd. Other company names, product names and marks mentioned herein are the property of their respective owners and may be trademarks or registered trademarks. 1Total amount of available memory may be less based on system configurations, graphics support, and other factors. 2Accessible capacity varies; MB = 1 million bytes, GB = 1 billion bytes, TB = 1 trillion bytes. Please note that a portion of the hard drive is reserved for system recovery, operating system and preloaded content software. 3Battery life will vary depending on the product model, configuration, power management settings, applications used, and wireless settings. The maximum capacity of the battery will decrease with time and use. Test results based on independent third party Mobile Mark (or Battery Mark) tests. Non-Metric weights and measurements are approximate.